On the last day in July, team Appcues rejoiced in some much deserved celebration. It was our largest sales month ever, a full 263% increase over the revenue we closed in June! Woah - pricing adjustments ftw. 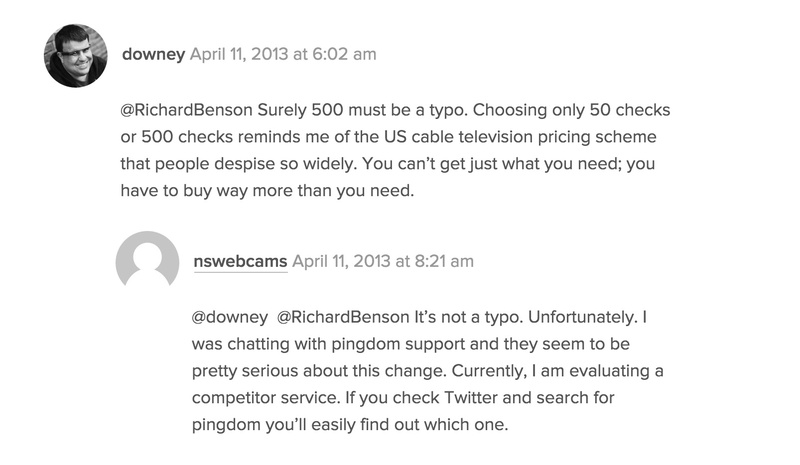 6 weeks prior, we began contemplating whether our pricing was too low. Price rarely came up as an objection in a prospect’s decision making process and we knew customers were getting a ton of value out of the product. So after some brief analysis, we developed a new value-based pricing strategy and planned the switch. Here’s how we did it, what went right, and how we’ll communicate things differently the next time we iterate on pricing. As a rule of thumb, the more targeted you can get your email communications, the better. We created 3 groups to announce the pricing change: existing customers, current prospects, and other free trialers. Since one of our goals was to keep current customers happy, we decided to grandfather them into their current pricing. It may not have been the profit maximizing decision, but as a young startup some of these customers have been with us since the very early days, and we would never want to harm our relationships. We tried to write the email to be clear and upfront, and dispel any concerns around our motivations behind the increase. It took a genuine tone. After all, we’re a pretty genuine group of people. Most importantly: we thanked our customers, and gave them sufficient notice to change their plan before the price adjustment. I already mentioned that we had record-setting revenue in July. Guess how much of that came from customers increasing plans before the pricing change? Zero. That’s right-no customers changed their plan. Appcues had scores of customers on our $45 plan that included Appcues branding. I expected a handful to move up to the Startup package before it moved from $200/month to $299/month. But not a single one did. In retrospect, we wrote this email (and a couple more that followed it) in fear of losing customers rather than in opportunity to sell more. It was a no-motion, not a promotion. For everyone who was not currently paying (current prospects who are nearing close and free trialers who may be less engaged), we wanted to use the pricing adjustment as an opportunity. Many times, our customer’s decision making timeline is tied to an event that is out of our control: they’re releasing a new feature in 2 months, or they don’t have the bandwidth to install for another 3 weeks, etc. For prospects who were already in an active sales process, we did additional 1:1 communication. 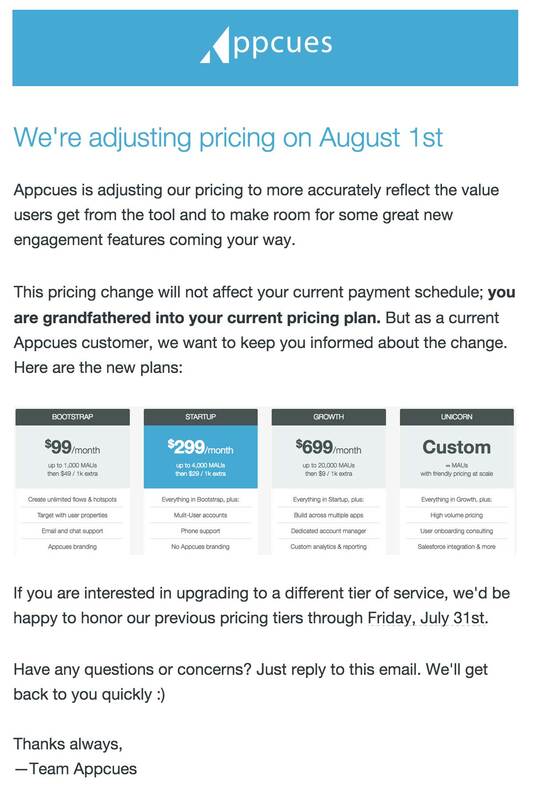 48 hours after these emails went out, our Director of Customer Development, John, reached out to contacts who had shown interest in the product and would be affected by the pricing increase. 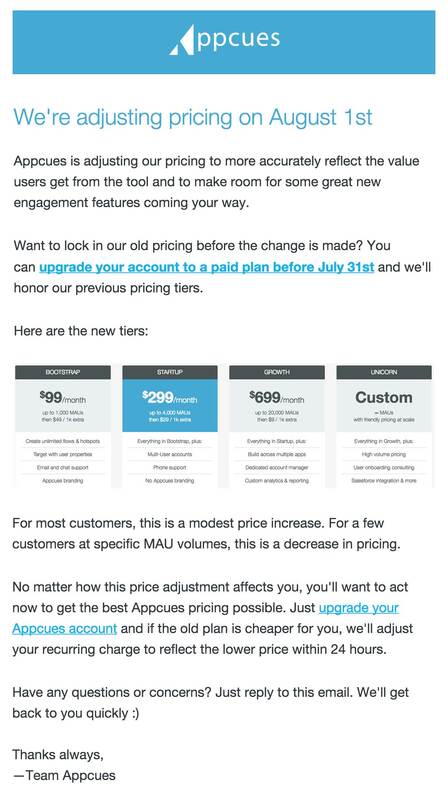 John pasted a copy of the marketing email below his personal note as a reminder of the details of the pricing change. The calendly link makes it easier for prospects to book time on John’s calendar. A lot. These emails were incredibly effective in reengaging free trialers and driving sales. The marketing emails averaged a >60% open rate and a 6.7% click rate. The personal follow up to the original marketing emails was key. Email boxes are cluttered and messages are often ignored. But John’s follow up was produced more demos and closed more deals in the week following than in any week prior. The emails were direct and asked for a purchasing decision. And that’s exactly what people did. Again, we could have framed these emails around the cost savings and strengthened the CTAs. 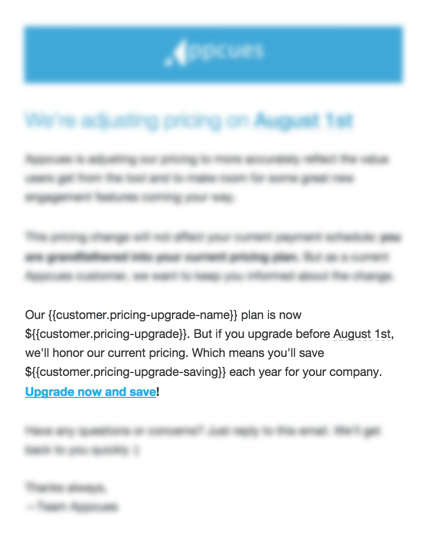 The emails also oriented around the price of each plan rather than the value. Sure—prices are going up. But this is still a marketing opportunity where we could of marketed exactly how Appcues will improve the prospect’s life. For our first major pricing shift, our communication strategy successful. We had a record-breaking sales month and were able to rekindle a lot of stale leads (sure, not 100% of that was attributed to the pricing change, but a lot of it was). The number one factor for this success is urgency. The pricing adjustment allowed us to inspire urgency where little otherwise existed. 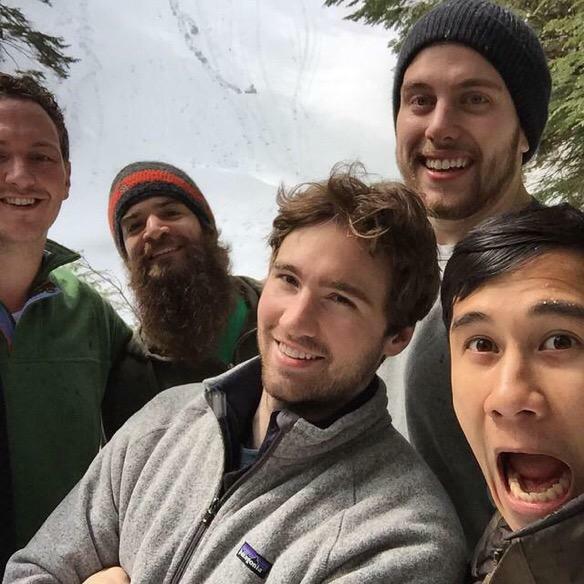 Many SaaS businesses (Appcues included) create urgency by offering a free trial. They are very effective. But when dollars and cents are on the table there is a tangible extrinsic reward for acting sooner. Everyone knows that pricing is a major lever of growth in any business. But too often people think growth only comes after the pricing adjustment occurs. If you are making an upcoming pricing switch, spend time developing the right communication strategy that optimizes for upgrades. We suggest grandfathering your existing customers into their current pricing plans to continue cultivating strong relationships. Insert CTAs in your email to prospects to help accelerate the deal conversation. And be sure to follow up with hot prospects directly so that they stay on-top of the pricing incentive. If you have similar luck, you will produce an increase in happy new customers while maintaining good relations with your legacy ones. Have other strategies to inspire urgency with pricing? We’d love to hear them - write a comment below.